Photo Courtesy of Mary Chappell Construction of the athletic practice facility between Mertz Residence Hall and the Norville Center for Intercollegiate Athletics. New buildings are popping up on and around Loyola’s Lake Shore campus following a summer of construction. Work continues on Loyola’s athletic practice facility following the completion of a new “flex lab,” and construction is underway on two new neighborhood developments. 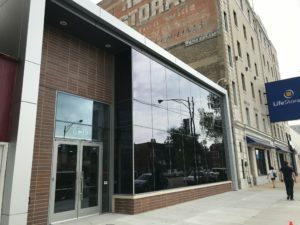 Next to Bar 63, a building Loyola is calling a flex lab was completed in July, with Loyola officially taking occupancy July 24, according to Peter Schlecht, assistant vice president of campus planning. The $4.7 million lab, located at 6339 N. Broadway St., was built to provide needed lab space. While the “flexible” lab was designed to accommodate different sciences, The Phoenix reported in January, the lab is currently used by Loyola’s Engineering Science program, according to its website. According to Schlecht, the lab has two classrooms, an area for capstone projects, three conference rooms and two student lounge areas. The lab will open its doors for classes this fall semester, Schlecht said. Photo Courtesy of Mary Chappell The flex lab is located on 6339 N. Broadway St., next to Bar 63. With the flex lab completed, work continues on another project — the construction of a $18.5 million athletic practice facility between Mertz Residence Hall and the Norville Center for Intercollegiate Athletics. With the foundation completed, steel is currently being erected on the site, Schlecht said. Construction will continue throughout the school year. The project is slated for completion in early August 2019, to align with the start of the fall semester and fall sports season. According to Schlecht, students living in Mertz Residence Hall shouldn’t expect to be impacted beyond usual construction activity. However, students in Mertz will be notified by residence life if the project will impact them significantly, Schlecht said. Beyond Loyola’s Lake Shore campus, new developments are transforming the landscape of the surrounding Rogers Park neighborhood. A new development called Concord on Sheridan is underway at 6418 N. Sheridan Road, across the street from Loyola’s Granada Center. The seven story building will include a Target store along with additional retail space and apartments. 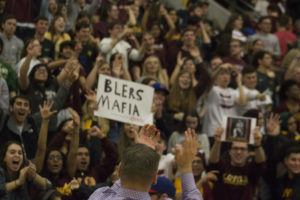 The site has experienced a number of delays resulting from the postponement of the original transaction closing date, weather and site conditions, Mike Landis, staff assistant to Alderman Joe Moore said. The project was originally set for a fall 2018 date of completion but has been given a new goal of March 29, 2019. The top exterior of the building is nearly done, Landis said, and mechanicals, plumbing and electrical work are being installed on lower floors. The building is expected to have a roof by September and be watertight by October. Landis said students living near the site will experience some traffic tie ups and construction noise as the process continues. Traffic around the location is expected to be impacted toward the end of August during water and sewer work, and then later in September for gas work. According to Landis, the 49th Ward is planning a community meeting to discuss the closures. Neighbors will be notified via email ahead of the meeting. “We want to have a meeting regarding the closure with the different parties to make sure that we are well informed and are able to thereby inform the community of the specifics,” Landis said. Students interested in receiving construction updates can sign up for them through kris.vandermeer@madisonconstruction.net, Landis added. Down the street, a new development called The Arcade (6361 N. Broadway St.) is also undergoing construction on the former site of the historical Woodruff Arcade. The Woodruff Arcade was the last arcade-style building in Chicago and previously home to a number of local businesses. The building was demolished in March following failed attempts to give it landmark status. The new development will be mixed-use and include residential units and retail space on the first floor. 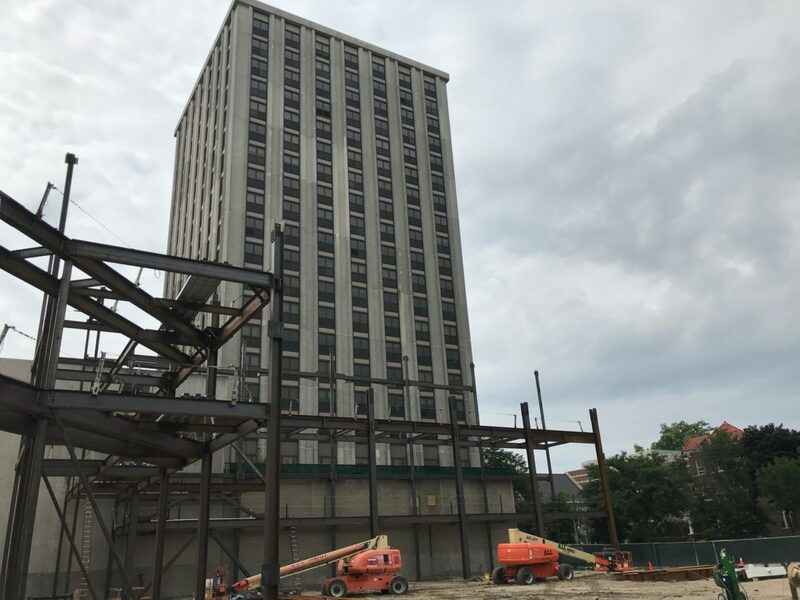 There is minimized construction activity on the site this week in an effort to avoid disrupting student move-in, Dan Luna, chief of staff for Alderman Harry Osterman, said. Next week, workers will continue pouring cement and all deliveries will be made from the southern end of the property. The sidewalk on Broadway will also be closed, with a protected pedestrian walkway provided, Luna added. The expected time of completion is Spring 2019 as published by Edgemark, the commercial real estate service working on the project. However, it’s unclear whether the project has stayed on target to reach this expected date. Luna didn’t respond to The Phoenix’s request for the current expected date of completion. According to Luna, the next construction update will released Friday in the 48th Ward newsletter. This story has been updated with the correct address of the flex lab and to clarify the lab’s current use by Loyola’s Engineering Science program.